One of the things I’ve done during this lovely spring break is look at some watermarks on the medieval manuscripts at Amherst College. 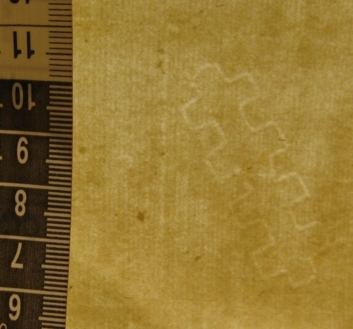 Watermarks are fun- the kind of picky challenge that sometimes pays off bigtime but often ends with just the small but fiddly satisfaction of having done something very precise. A branch (MS B 3.12); that’s cm on the tape measure. One two-volume set (MS B 3.19) had many watermarks: some variations on a cross on top of three mountains, some variations on three circles, some heraldic shields with a fleur-de-lis and a crown, some with initials, some without… I made a chart. I like making charts. I thought about horned animals, based on part 1, but no luck. Couldn’t make heads or tails of the other part, and before I tried photoshopping them together, I was told that they’re shears, similar to, but not actually identical to, some of these. And then there’s the last one. If there were such a thing as a were-octopus, this might be a picture of it. Or maybe it’s an early (for Western Europe) and confused picture of a kangaroo. A cross between an aardvark and a jellyfish (though the bunny ears on the side are a problem). Most likely, while I’m poking through watermarks looking for other things, I’ll find this and suddenly it will make perfect sense. This entry was posted in Uncategorized on March 20, 2014 by Anna Strowe. 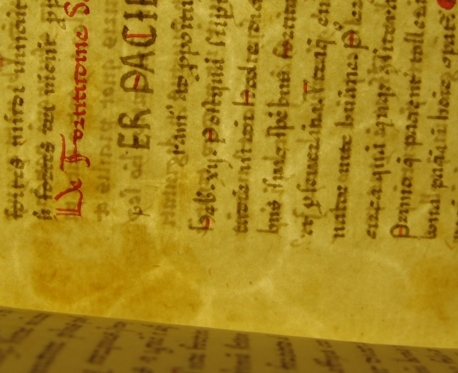 I’ve mentioned before my work with the Five College Medieval Manuscript Digitization Project. It continues to be exciting (borrowed a librarian’s compact purse mirror the other day to work on transcribing the off-printed text on an old manuscript pastedown). Today though, just a micro-post pointing at the blog of Lisa Fagin Davis, who’s doing the metadata for the project (and, full disclosure, is one of my supervisors). 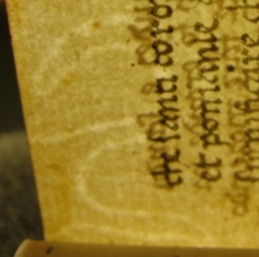 Her latest post is about digitally reconstructing texts, and her case involves one of the Ege leaves that’s held at UMass Amherst! Read all about it at her blog. This entry was posted in Uncategorized and tagged Digital Humanities, UMass Amherst on March 7, 2014 by Anna Strowe. A lovely footnote from a current research project. I was looking up genealogical records for the Birnie family of Broomhill, to try and figure out the provenance of Smith College Mortimer Rare Book Room MS 274, which has the names of both Mr. Robert Birnie, Minister of Lanark, and John Birnie of Broomhill. (Robert (1608-1691) was relatively easy, since there weren’t many Roberts in the family; every generation had at least one John, though, but my bet is on John (1643-1716), Robert’s only son.) I was using a funny little genealogical volume, Account of the Families of Birnie and Hamilton of Broomhill, by another John Birnie (the son of John son of Robert), edited and printed in 1838 by W.B.D.D. Turnbull. It’s a nice little volume, available on archive.org, that has the Account following an account by W.B.D.D. Turnbull on a particular dispute involving many members of the Birnie and Hamilton families, regarding church interment. Mr. Turnbull had previously (1833) reprinted a copy of William Birnie’s (1563-1619) treatise against the practice of church burials, and prints this volume of genealogy and documents relating to the later dispute as additional material. At the end of the analysis of the dispute, which is a section labeled “Prefatory Remarks, we find a description of the heraldic bookplate that apparently appears in several books that Mr. Turnbull has before him. They do not, evidently, impress Mr. Turnbull, who remarks in a footnote that “Heraldry was never properly studied as a science in Scotland. The present officials of that elegantly organized establishment are about the most ignorant reptiles that ever crawled between earth and heaven” (xviii). The object of Turnbull’s scorn? The Birnies of Broomhill, in creating their crest, did not follow the rules, resulting in what Turnbull refers to as “a heraldic freak” (xviii): “They have given to their shield as supporters, two parsons precant, sable, in reading-desks–all proper!! La voila!” (xviii-xix). As substitutes for the usual zoological complement of lions, unicorns, and gryphons, it must be said that the parsons, even when referred to with the French-influenced language of heraldry as “precant, sable,” seem a little odd. Birnie, John, Esq. 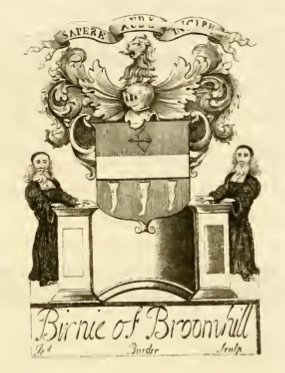 Account of the Families of Birnie and Hamilton of Broomhill. Ed. W.B.D.D. Turnbull, Esq. Edinburgh: Printed for Private Distribution (Edinburgh Printing Company), 1838. Genealogical material possibly taken from BL Add. Ms. 28850, but the BL dates the genealogical part of that manuscript to 1730, and the printed volume includes deaths up to 1733. This entry was posted in Uncategorized and tagged Humorous oddities, Research, Smith College Rare Books on February 26, 2014 by Anna Strowe. Just a month into my faculty contract and I’m already taking full advantage! I just got awarded a Flex Grant for Teaching and Faculty Development by the Center for Teaching and Faculty Development and the union (MSP), to start building a multilingual audio and text database for our interpreting courses. UMass Amherst runs interpreting courses that are multilingual, include both students who are native speakers of English and those who are non-native English speakers, and have students who are at different levels of language proficiency (they are courses in interpreting studies with a heavy practical component, but not designed to be primarily interpreter-training classes). A significant part of the class is dedicated to readings and discussions about issues in interpreting, from linguistic and skill-set questions to debates on ethics and best practices to historical analyses of the role of interpreting. But about half the classes are set aside for practical work. A possible solution: an in-house audio bank. Texts chosen for non-technical vocabulary on a variety of topics, recorded in English, translated into the languages we need, and recorded in those languages as well. It’s not the same as working with “authentic” texts or situations, but this is training, and the “authentic” texts that are available are difficult to sort through and often problematic in one or more ways (problematic accents, technical vocabulary, mumbling). I know that if my students go into interpreting, they’ll need to be able to deal with those issues, but this course is intended as an introduction to interpreting, not a finishing school. Choosing texts and then having them translated and recorded means that the whole class can work on the same topic (roughly the same text) at the same time, address the cultural issues that arise as a class, and even be able to check their understanding of the text with the written versions in either language. I’m trying to choose texts that are not so specific that in a year or two we’ll have forgotten the context. General-knowledge, on topics that might be relevant to interpreting, with minimal vocabulary demands (this isn’t the place to challenge their vocabulary while they’re working on their interpreting- vocabulary building can happen outside the practice session), spoken clearly and a tiny bit slower than normal, with decent pauses. Given a solid corpus of audio to use at the beginning of the semester, we can then try to work our way up to authentic texts (also giving the instructor time to find some in all of the languages!) by the end. The grant will go to pay translators and speakers to record the translations. I’m first trying to find graduate students in the department or college who are native speakers and have some translation experience; if I can’t find the languages I need that way, I’ll look further afield. I’m aiming for four (short) texts translated and recorded in each of the current five languages by the end of the semester; it’s not a huge grant, and my contract ends in May anyway. But it’s a start, and a neat project that can keep getting built little by little. This entry was posted in Uncategorized and tagged Administration, Digital Humanities, Teaching on February 19, 2014 by Anna Strowe. A research project has snuck up on me, as they often do, from where it was lurking in another project. While working at the Smith College Mortimer Rare Books Room, in my character as measurer of manuscripts, I came upon a thirteenth-century Bible, possibly from the Rhine provinces. A lovely big book, 33.5 x 22.6cm, with a pretty illuminated initial at the front. What caught my eye, though, was the inscription on the flyleaf, dated 1312. The hand is difficult for me, and apparently for others as well; a mid-20th century interlinear pencil notation transcribes some of the words, but not all, and even some of those transcribed seem to be wrong. I pieced together some of it the first day, but I still didn’t have enough to figure out all of the place names. The next time I was in, after I finished all the measuring, I came back to it, this time with some help from an emeritus classics professor, with whom I pieced together more of it. By the end of that session (we were still working when the librarian needed to go to a meeting, so she locked us in at 5), we’d figured out almost everything. Apparently I needed a project like this- a bit fussy, out of my sphere, and exciting. Really needed it, or maybe even needed a few, since I was already working on the Istoria della Fine del Mondo manuscript, which shares many of those characteristics. It’s become a minor obsession. I have half a dozen books out of the library, call numbers for half a dozen more, and a few ordered from interlibrary loan. It refers to Dns .I. de Marignac, who was not Enguerrand de Marigny (chamberlain to Philip IV of France, and sometimes spelled Inguerrand), but more likely his half-brother Jean de Marigny. So really, the power of the measurer (meotodes meahte, stolen from Cædmon, but taken here without divine implications) is apparently the power to come back to the library later and do more research. At least, that’s the power of this particular measurer. This entry was posted in Uncategorized and tagged Research, Smith College Rare Books on February 12, 2014 by Anna Strowe. This project was technically not a 2014 one, but it came after the fall semester ended, so it felt like a not-last-year kind of activity. 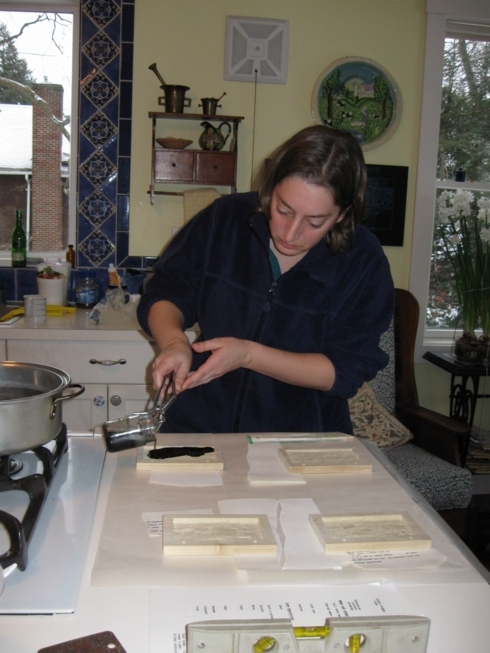 Over the years I’ve done a lot of different book projects, including a summer as an intern at the conservation lab at the Bentley Historical Library at the University of Michigan. For some reason, recently I got it into my head that the next thing I wanted to do was make a set of Roman-style wax writing tablets. The internet is a wonderful thing, and so is having parents with odd and diverse interests. The internet turned up a couple of very detailed instructions on how to make wax tablets, one from Australia (I think), and one from the U.S. (locations relevant for units of measurement and currency of price estimates). The parents turned up two sets of wood chisels, a knowledge of different types of wood, a carving mallet, and a box of drawing charcoal scrap ends. 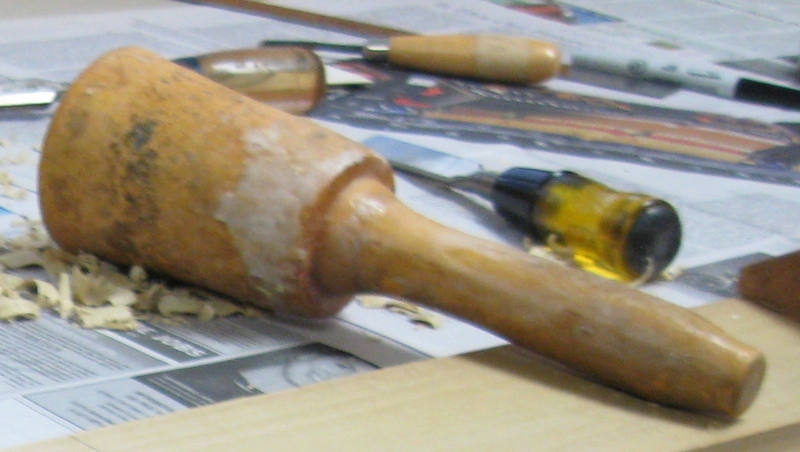 The wood mallet and some of the chisels. Along with some wood chips. The parents also produced a miter saw, a vibrating sander, and a drill press. The basement contains multitudes, apparently. To add, however, to the existing descriptions, here’s mine. First, I marked off the size of the tablets on my piece of wood, leaving a couple inches between them. Then I marked the size of the well that I was going to cut. I actually did two sizes, two tablets that had 3/8″ to the edge on three sides and 5/8″ on one of the longer sides, that I was going to make an 1/8″ well in, and two tablets with 1/2″ on three sides and 5/8″ on one of the longer sides that I was going to carve to 1/4″ deep. I figured that the deeper one could do with a slightly thicker wall. Carving: Clamp the wood down or brace it against something immobile (I used clamps). I used two different methods for chiseling out the space. For the first one, I marked in pen on my chisel 1/8″ from the edge, and then went over the outline (straight side of the chisel facing out) of the well. Then I made a grid inside where the well would be, of cuts 1/8″ deep (or as close as I could get). I then used the chisel to peel off the wood from the well, with the grid helping to keep me from accidentally taking too much off at once. It worked OK, but it was pretty hard getting to 1/8″ deep against the grain, and I was worried that in getting to 1/8″ with the grain, I would split the wood further than I wanted. For the deeper wells, I tried a different method. I took out wedges around the edge until the edge was as deep as I wanted it, leaving a sort of island in the middle that was still the full thickness. Then I worked on the middle to get it to the depth of the edges. That worked better. Method 2- the far well is finished, the near one has just the wedge around the edge taken out. Once the wells were done, it was time to cut the tablets. Miter saws are lovely. It wouldn’t be hard to do this with a hand saw either, though. 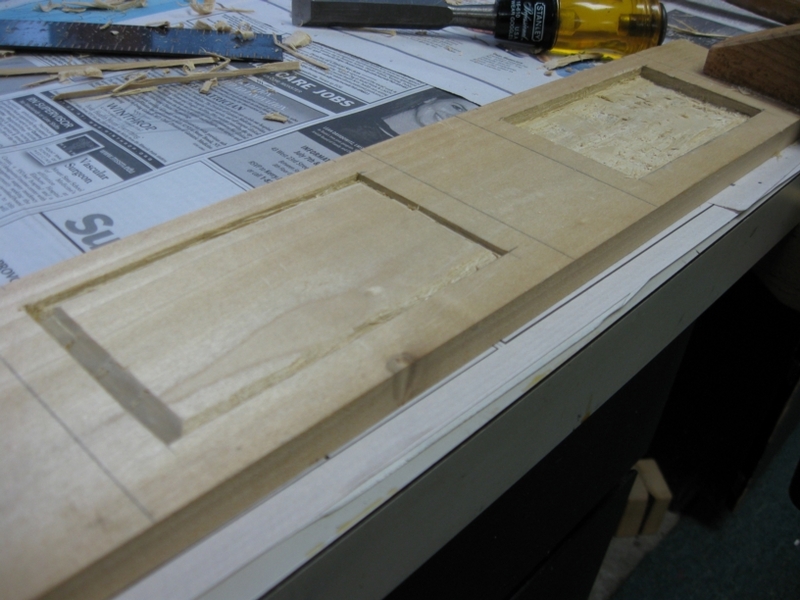 Then I marked and drilled the holes in the wider edges that I would use to tie the two sets of tablets together. Again, drill presses are pretty cool, but an electric drill would work fine too, and a hand drill might be an even better story, especially if you’re going for authenticity. 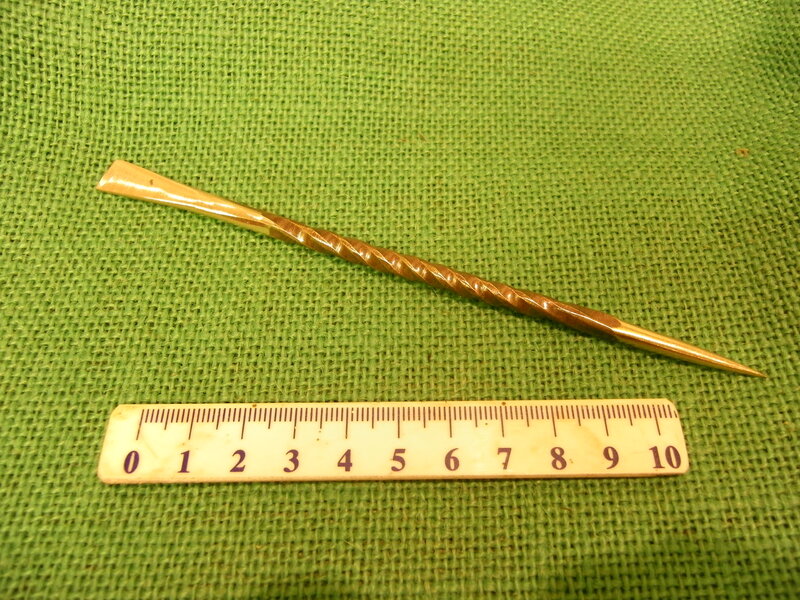 (For those really mechanically inclined, I also beveled the drill hole edges.) Then comes the sanding. DON’T SAND THE INSIDE OF THE WELL. You need the roughness to catch and hold onto the wax. But make everything else as pretty and smooth as you want to. You can also, apparently, at this point oil the wood or treat it otherwise, with the same caveat (that you don’t oil the well). I didn’t. I regret nothing. Now comes the nice-smelling part. 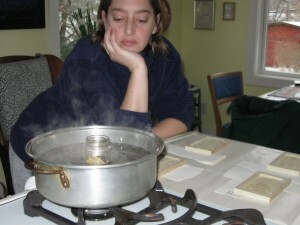 You can use either double-boiler or a water bath to melt your wax. I chipped was off a 1 pound block of beeswax from a beekeeper at our local farmer’s market and put it in a little glass jar on a steel rack inside a pan filled with water. I took no notes and didn’t pay very close attention, so I can’t tell you how much wax to use, but it was more than I had guessed and far less than a whole pound. That’s helpful, right? Once it melted, I added a little bit of the powdered charcoal to make it black- maybe a 1/4 teaspoon total. I did a little bit at a time and stopped when I was happy (tested the color by pouring a little wax onto a piece of tin foil then hardening it quickly in the freezer to see what color it was when cooled). Now comes the patience. No matter how smoothly you pour, you’ll probably get bubbles in the wax. 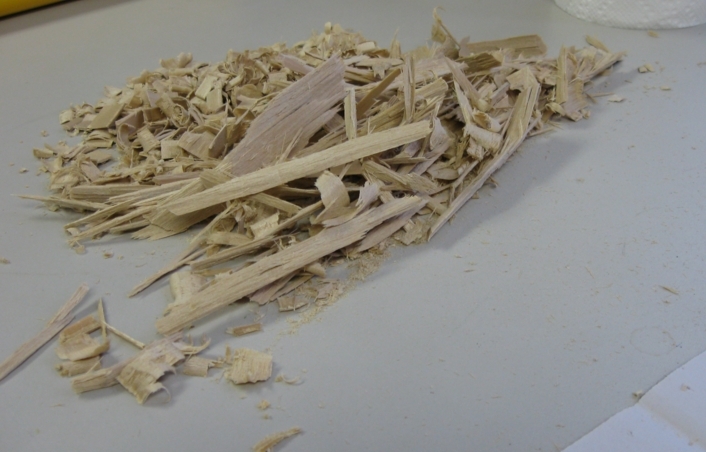 One of the other people who wrote instructions suggests that it’s from the air trapped in the wood (or against the wood?). Wherever they come from, they’re a huge nuisance, because I’m a bit of a perfectionist. The best results I got were from pouring the wax, scraping the very top layer off, and then pouring again a new top layer. The problem with this is that it has pretty high surface tension, so it doesn’t like to spread thinly and evenly. In fact, it tends not to get into the corners no matter how well encouraged. And a skin starts forming pretty quickly, so you’re sort of limited in how you can encourage it to cover the surface. You can also pour as thin a layer as you can and then another over it. My wells just weren’t really deep enough to do that properly. Next time. 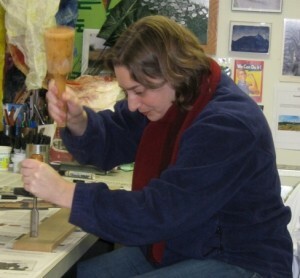 Pouring the wax. Quickly, but without burning oneself on the molten wax. Trying to get the wax into all the corners with a chopstick. I don’t recommend this method, largely because it didn’t actually work all that well. I got better results just tipping the tablet right after pouring the wax in. I did try one other thing, to see if it would work. I took one of the tablets and put it on a tray in the oven, with the temperature set to about 180F. 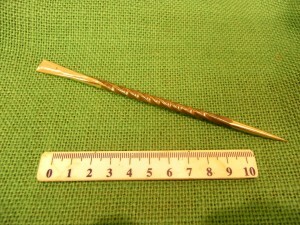 The wax melted, eventually, and set quite smoothly and without bubbles. It didn’t even pull away from the edge as it cooled like some of the other tablets did. The only problem was that heating the wood encouraged whatever cracks or stresses were there and so the wax traveled down the grain in the corners and made it look a little messy. So it goes. Finally, once the wax has cooled (I gave it a long time), tie the leather thongs through the holes in the tablets and ta-da! 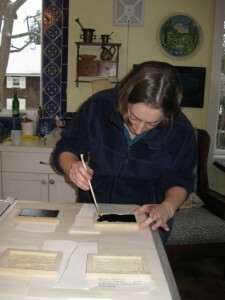 diptych wax tablets. 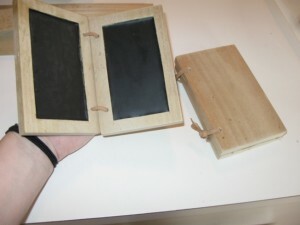 You write in a wax tablet with a stylus, which you can make if you so choose (details and suggestions on both of those other sites). 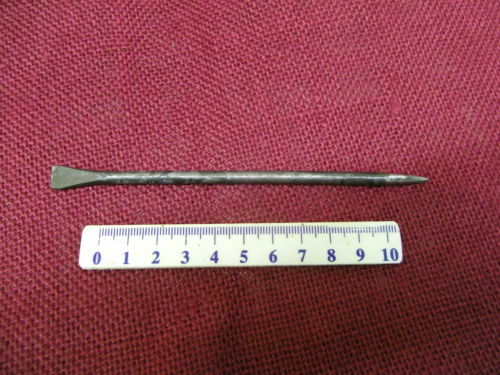 I instead decided to turn to an odd business outside of Sheffield, England, called Daegrad Tools, who make hand-forged metal objects from the late Roman and Anglo-Saxon periods, mostly (they say) for historical reenactment and living history displays (who knows how many objects are sold to people like me, though). They’ve got a couple different styli that they sell. I actually got two because I couldn’t help myself, and I had two sets of tablets, so I really needed two styli, one for each. They’re quite nice. Arrived pretty quickly. I haven’t taken pictures of them, but here are pictures from Daegrad’s website. And thus we reach the end of this particular project. I have two little wax tablet diptychs on my shelf, with appropriate writing utensils for them. So there’s one project brought to a close, at least until I decide that I want to make some that are larger. I still have probably at least 3/4 pound of beeswax, after all. This entry was posted in Uncategorized and tagged Geeky Downtime on January 25, 2014 by Anna Strowe. Another new project takes me a little away from my usual literary and textual stomping grounds: to the late 17th century in Italy, and an odd little manuscript titled “Istoria della fine del mondo, nongià del quando ma del come finirà” [History of the end of the world, not of when but of how it will end]. It’s written mostly in Italian by a certain Americo da Firenze, about whom the holding library knows nothing else. The manuscript is in the collection at the Massachusetts Center for Interdisciplinary Renaissance Studies, fondly referred to at the University of Massachusetts as the Renaissance Center, and where I am a visiting fellow this semester. I’ll be working on a basic description and transcription of the text over the next weeks or months; I have found a few things I might disagree with in the existing description, and there is no transcription. The project might go in different directions from there, like translating the text or working on identifying sources, but the transcription will take some time. The text is occasionally messy, often crossed out, corrected in the margins, with four extra pieces of paper pasted in with more additions or corrections. Right now, I’ve done the first page, which is two quotes from Augustine and then a large chunk of text to replace the introduction that was originally much shorter, on the next page. I’m also reading up on my Apocalypse, in the Vulgate and using Douay-Rheims for comparison. If I get to the point of identifying sources, I’ll have to decide what text to use, and how much research to do on possible Italian translations of the period. I’ll be giving a talk on the work in early April, so hopefully more news on this project by then! This entry was posted in Uncategorized and tagged MCIRS, Research on January 22, 2014 by Anna Strowe. Despite a lot of continuing projects (finding a job, revising the dissertation, keeping the yarn away from my cat), somewhere between the beginning of the Western calendar year and the impending start of classes at UMass Amherst, it feels like a new year. And for a new year, new challenges and new projects! This will be the first semester that I teach more than one course. There were a few semesters at the start of my Ph.D. when I was teaching in Italian where I would teach two sections of the same course, but since it was the same course, it was very similar preparations. This semester, as an almost-newly-minted Ph.D. and a Lecturer A (the Ph.D. mint date is February 1 and the Lecturer A mint date is January 18), I’ll be teaching two separate courses, both upper level, in Comparative Literature. I’m lucky for a number of reasons, first of all that I’m really interested in both, and second that they’re both pretty small courses (one is actually almost TOO small right now, partly because of a late announcement of the course, after people had signed up for classes). Course 1, which has been part of the plan for a while, is in Interpreting Studies, focusing on simultaneous interpreting. It’s not really a training course, although there is a significant practial component. Our program follows the lead of translation studies, where practical training can be paired with a more theoretical investigation of the social, cultural, and political implications of the practice. The course is the second of a pair, so I’m taking over a group that already had one semester together. The professor who designed both courses and usually teaches them is on research leave for a semester, and was very happy with the idea that I could take it over temporarily. It’s still partly under development– last year was the first year of this new pair of courses– so while there is a syllabus from last year that I am largely following, I also have the freedom to make adjustments, as long as I take notes on what I adjust and report back to her about how it went! Course 2 was a bit of a surprise. I’d mentioned it months ago as something I would like to teach, and we’d talked about possibly offering it this semester, but then the subject got dropped. For a while it seemed up in the air how many lecturers the department could hire this term, and I was happy to be teaching one course, so I didn’t push. And then, a week before the schedule went online for registration, I heard from the department chair that they wanted to hire me for both courses. There was a bit of a scramble to get a description together and get the course online (it went up late), but it’s there, and it’s running. The general course is “Comparative Book Cultures,” which hopefully will continue to run as a sort of topics course, depending on the geographical and historical interests of whoever is available to teach it. But I’m teaching it this semester, and it’s going to be medieval all the way. There are three strands to the course: readings in medieval literature that discuss books, writing, and reading; work in manuscript studies and book history; and hands-on work (as much as I can manage) with calligraphy, book binding, and whatever else I can put together with no funding. We’ve got two rare book rooms with medieval holdings close enough to hold a class there (2 more close enough for students to easily visit on their own or do research), and I have a colleague who had a previous career as a rare book conservator who will give a guest lecture. And the quill pens I ordered arrived while I was at the MLA. So: two courses to teach that are both new to me, in totally different fields, one of which is completely new. My first semester out of school, as a lecturer. I’m sure there will be moments where I can’t believe I said this, but I can’t wait. This entry was posted in Uncategorized and tagged Teaching on January 16, 2014 by Anna Strowe. 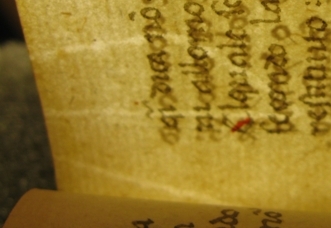 I was reminded a couple of weeks ago of the thrill of discovery, or perhaps “discovery.” I’m working with the Five College Medieval Manuscript Digitization Project (website), and was doing some basic work getting some images we can work with for cataloguing (while the nice images are being worked on), and measuring the leaves of the UMass Ege collection. I was curious to know what the next oldest book or leaf in the UMass Special Collections Library was, so I did a really basic search in the library catalogue: location Special Collections and date 1100-1600. I knew there was a copy of Giovanni Battista Giraldi Cinzio’s Hecatommiti from 1593, because I’d consulted it a few years ago. Turns out there are a bunch of early printed books, but more importantly for the Manuscript Digitization project, there’s actually another medieval manuscript! It hasn’t been entered into the project catalogue yet, but I got a chance to look through it. It’s a list in alphabetical order of the interpretation of Hebrew names from the Bible, in a version that was common in the thirteenth century (incipit “Aaz apprehendens”). This particular exemplar has 38 folios (three gatherings of 12 and two leaves at the end), and ends with “Tirus angustia v[e]l tribulatio s[i]v[e] plasmatio aut fortitudo” (transcription from the MARC record). It’s a fragment of a larger volume, as evidenced by the fact that the gatherings of this piece are numbered 32-35, in pen, in a much later hand. If the first 31 gatherings were also 12 folios each, it’s possible (likely even?) that it contained an entire Bible before the list. The volume as it is now was rebound in the late 1980s* in marbled paper boards with a leather label on the cover. It also has a clamshell box that’s UMass-made. The library’s MARC record indicates that the volume was bought from Bernard Quaritch in 1988, and the special collections librarian I spoke to about it said that it must have been a gift, since they don’t usually buy from Quaritch. I’ve got a lead on a set of Quaritch catalogues, so I’m going to try to track down the sale and see what else I can find out about the volume. Once I know what sale it was, I might even be able to find out the price and who bought it, since Quaritch keeps an archive of sale catalogues, including as much of the sale information as they can. In the meantime, despite the fact that this book was in the catalogue and not hidden, I feel like I’ve discovered something. It’s good to know that the thrill is still there. * The rear paste-down has a watermark with the year 1985, and the special collections librarian was positive that UMass wouldn’t have done that rebinding, so it must be between 1985 and 1988. This entry was posted in Uncategorized and tagged Being an Academic, Research on December 6, 2013 by Anna Strowe. May there be jobs that we want, with colleagues that we like. May the committees find what they are looking for, with a minimum of stress. May the interviews be pleasant (and plentiful for all of us). May the visits be congenial. And may we all survive unscathed. Good luck to everyone, on both sides of the table. This entry was posted in Uncategorized on September 27, 2013 by Anna Strowe.